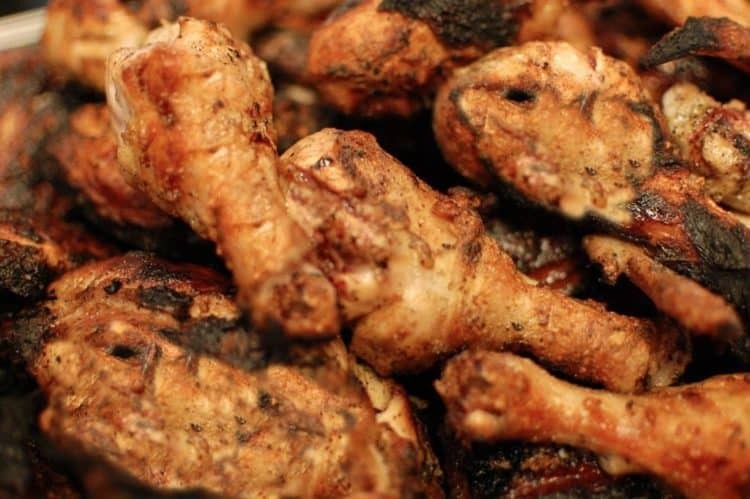 Try this Cornell chicken and you’ll agree it may be the best barbecue chicken you’ve ever tasted. Cornell Chicken Barbecue, over hot coals. Anyone reading this post and who has followed Platter Talk knows that my love of all things tasty started in my early childhood. The foothill region of upstate New York state’s Adirondack mountains is known for its harsh snowy winters, its soft hilly landscapes, outdoor recreations of all kinds, and like any area, unique foods not found anywhere else. When making this barbecue chicken, it’s normal (I even prefer) to have some char on the skin. The coals will be kept hot with the oil in the marinade. Be sure to have some water handy to put out any flames! 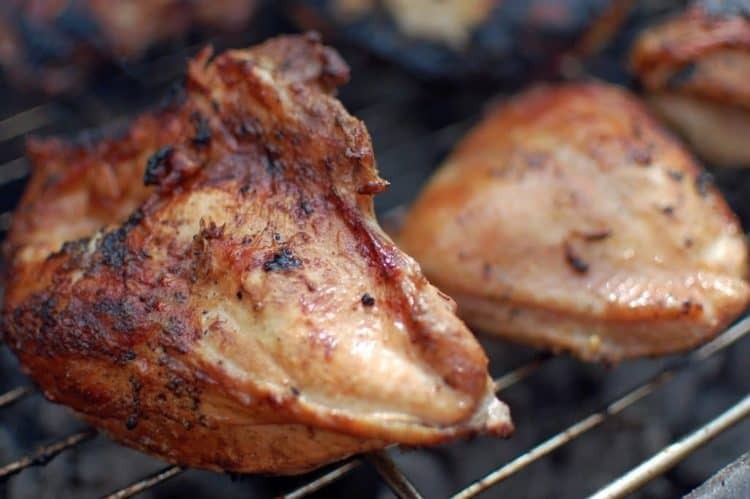 This Cornell chicken recipe is what I grew up believing to be a family recipe for grilled chicken that was first concocted by my Grandpa Zehr. Of course no one referred to it as grilled chicken back then, nor do they today. In northern New York state it’s called barbecued chicken and through the years it gradually dawned on me that it wasn’t my Grandpa Zehr who put this recipe together. My brother Don and nephew, Sam. These guys know their way around Cornell Chicken Barbecue. Cornell Chicken Recipe. The unofficial food of the New York State Fair. This recipe for Cornell Chicken works great for any cut of chicken. Sometimes I’ll just buy a package of drumsticks to make this way, which is how our boys love it. In the mid-west, specifically Wisconsin, there are “brat fries” every single Saturday, somewhere throughout the state – winter, spring, summer and fall. In northern New York state, chicken barbecues are almost as common. It is made for benefit events, at community auctions, at church functions, family reunions, the New York Sate Fair, and in and around just about any life event that can be accompanied with food. Traditionally this Cornell Chicken is served with salted white potatoes. We usually enjoy it with a green salad and baked beans. It always hits the spot! I was nothing less than shocked when I discovered just a few years ago by googling Cornell Chicken, there were multiple web pages referencing this home delicacy. For me it was as if my Grandfather who would be well over 100 years old today, had suddenly aligned himself with Google. Dan and Scot, on Living with Amy, showing folks how to barbecue chicken using the famous Cornell Chicken Recipe. Mystifying yet real. It’s not unusual for my brother-in-law, who now lives in Sarasota, Florida, to put 40 lbs. of juicy, plump chicken over a hot bed of coals, encased with cinder blocks. 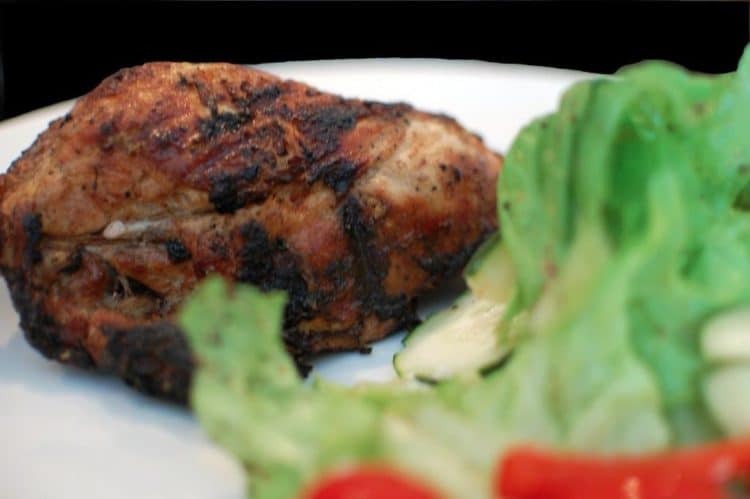 Often times the chicken is grilled in halves, providing a serving size for the most serious of eaters. Many people have told me that this is the best chicken on the grill that they’ve ever had. I try to put this Cornell chicken recipe together once or twice a year. On this past Memorial Day weekend I made the commitment to prepare it over coals, in lieu of a gas grill. A day before I made it, I called my brother Don, some 1,200 miles away to gain some input from him on the technique. 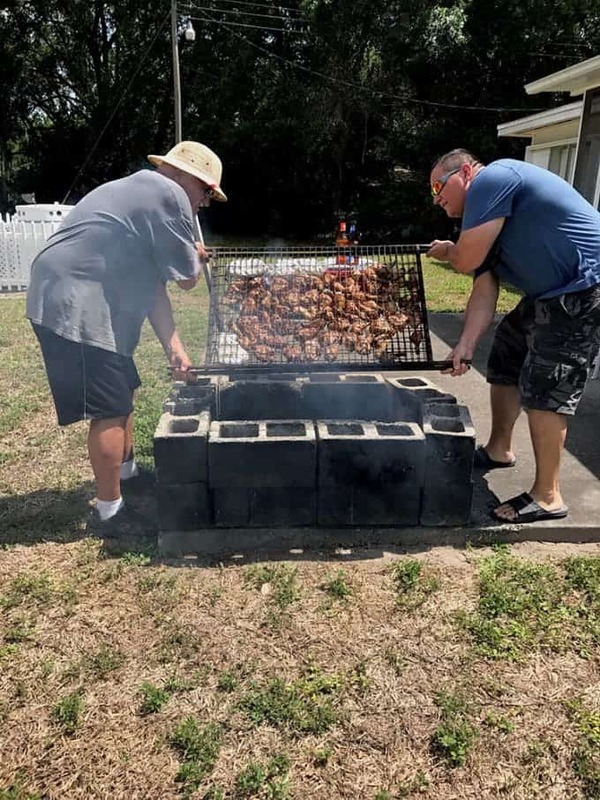 He offered no direct advise but just some cautionary words about wind, about the importance of not covering the grill while the chicken grilled, and the advantage of being able to adjust the height of the rack depending on the heat of the coals. The oil in the marinade will fuel the fire. Have a glass of water to quell the flames when necessary. The chicken skin may look burned, that’s OK! Just don’t let the fire get away on you. You can’t leave the grill unattended when making Cornell chicken, it’s a very hands-on process. Realizing he couldn’t give me any more specific hints on a successful outcome since he was in Florida and I was in Wisconsin, I was happy for at least having an excuse to chew the fat with him over the phone and to have the chance to say hi. We never get together enough anymore. If you haven’t ever had Cornell chicken, make it a goal for this grilling season! When I was a boy, we never marinated the chicken. Instead, my mom or dad would constantly baste the meat as it barbecued over the hot coals. This method can build a savory crust which you have to taste to fully appreciate! If marinating, it’s best to soak the chicken a minimum of 2 hours but up to 24 is even better. I have actually marinated the chicken for 2 days before grilling it and it turned out beautiful and delicious. 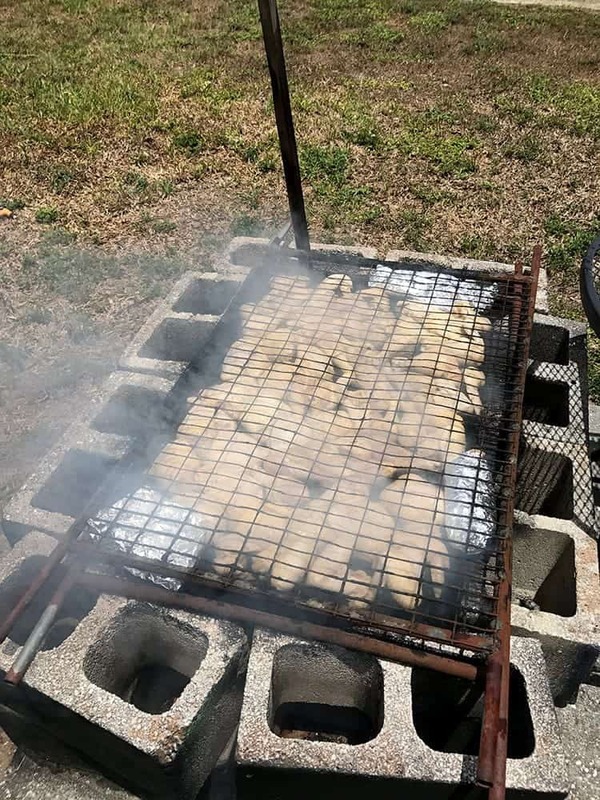 Back to where I started with this post, and back to where I started this life, I grew up eating this chicken and my family has continued to make it for many decades now. 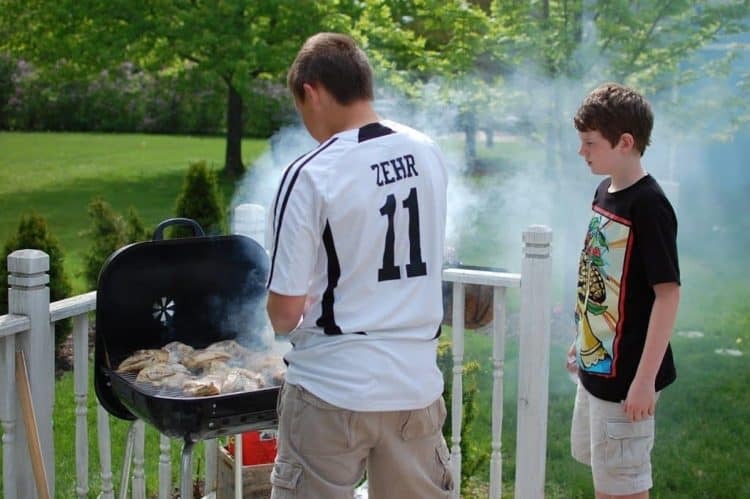 I couldn’t help feel some pride as I watched my 16 year old son tend the grill over Memorial Day weekend, realizing he was the fourth generation of my family to make this down-home-food, a recipe standard that is now a part of my roots. Cornell chicken has been a tradition in my family for nearly 100 years, spanning five generations. Two other families joined us for the “barbecue” and this Cornell chicken recipe was a hit with everyone. The taste was as I remembered growing up, and I loved having the chance to tell my boys a little about the recipe and how it was a part of their heritage that someday they would be making for their kids. Good outdoor weather is here now, and I realized that we have to plan a chicken barbecue again, very soon. 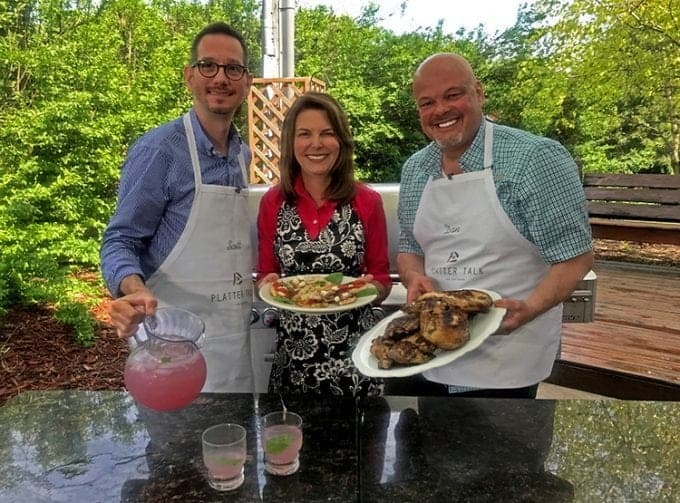 Watch the Platter Talk Guys making this Cornell Chicken Recipe, on Living with Amy! 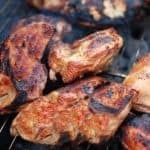 This Barbecue Chicken recipe may just be the best chicken on the grill that you've ever tasted. In a large bowl, combine oil and vinegar, add egg and beat thoroughly until will mixed. Add remaining dry ingredients and stir well. The chicken can be marinated from 2 hours to overnight, or it can be basted with a brush, while on the grill. To marinate, place chicken in bowl, and pour sauce over it and cover with plastic wrap. Refrigerate until ready to grill. Prepare charcoal in grill and heat till coals are starting to turn white, then evenly distribute coals throughout base of grill. Place oiled rack on grill. 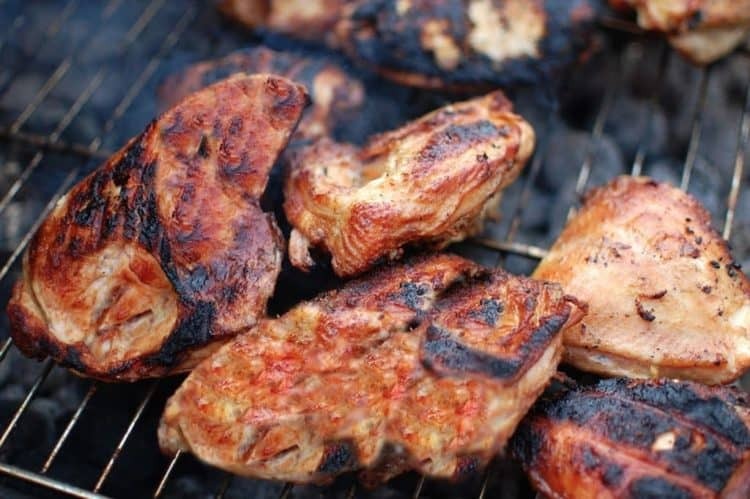 Place chicken on grill and barbecue on each side 20 to 30 minutes, depending on heat of coals. Turn frequently to avoid burning. Grill until juices run clear when cut with tip of knife, or internal temperature reaches 165 degrees. Adjust sauce/marinade quantity to amount of chicken you are grilling, maintain a 2:1 ratio of cider vinegar to oil. Similarly, adjust salt and other seasonings to quantity and taste. If marinating, place chicken in gallon size zip-lock bags. Place sealed bags in large bowl or basin in refrigerate. Rotate the bag periodically to ensure even distribution of marinade. The chicken will require constant attention while grilling due to the oil dripping on the coals. Have a glass of water available while grilling to squelch flames from hot coals. 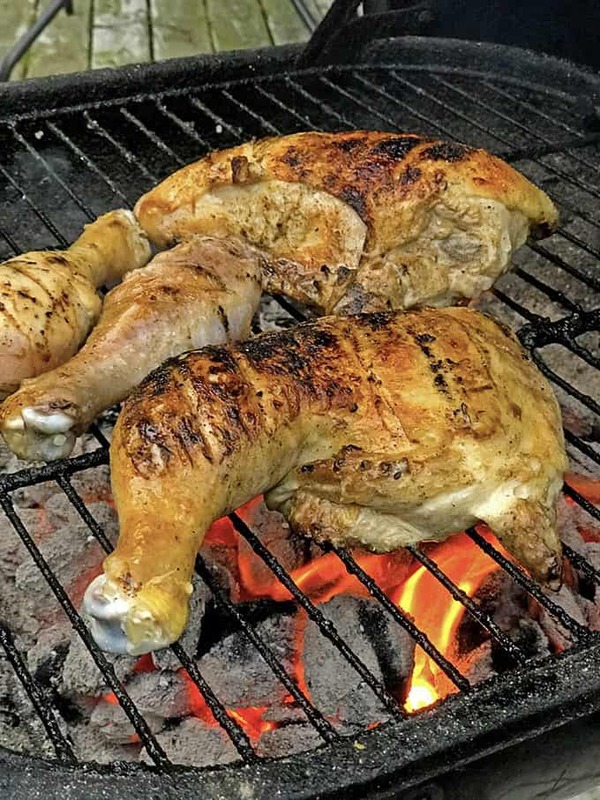 If chicken is cut up into breasts, thighs, wings, and legs, start off by grilling the breasts and thighs as they will take longer than the smaller pieces. Avoid closing lid on grill if possible to avoid smokey flavor. If you have to close lid, be sure to open vents on lid. You can make this on a gas grill as well. Preheat grill to medium high setting and tend to chicken as outlined above. Nothing goes better with this chicken than a green salad and baked beans! I’ve live 10 minutes from Cornell. I’ve done chicken wings this way since ‘84 when my neighbor, a Cornell employee, did wings (only) on a wood fire. He had a hand-written copy of the recipe he obtained from the two people who originated it. Over the years, it seems the ratios and the type of chicken parts used have changed considerably. The original was intended for wings only marinated for 24 hours. Far less Apple cider vinegar is used, a 1:1 ratio oil/vinegar. For this ratio, 1-2 tbsp poultry seasoning, 1 tsp white pepper, salt to taste, 1 large egg beaten. The egg enables the marinade to adhere better to the wings. I’ve done these on wood coals, charcoal, gas and electric oven. Far and away, grilling slowly on wood fire coals yields the most flavorful and authentic result due to the smoky flavor imparted by the coals. As with other variations, you must pay close attention, watch for flare ups and extinguish, turn frequently. 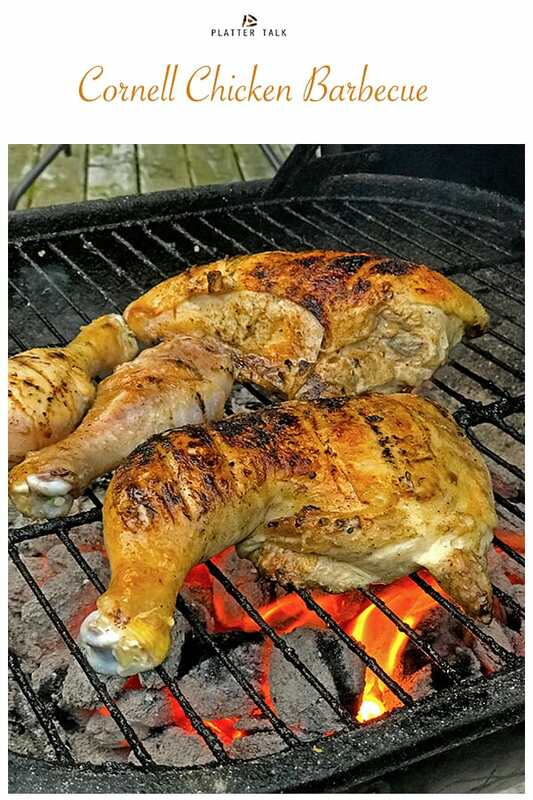 We love your comments and hints for making this Cornell chicken barbecue, Linda. Thanks so much for taking the time to write to us! Oh Dan, THIS chicken…THIS barbecue chicken…THIS Cornell Chicken…is THE chicken of my dreams and one I have never mastered. You have inadvertently just planned my weekend, and my mind is racing. I have to plan a party and send out invites, dig a firepit in my backyard to double as a grill, buy a ton of paper plates and paper towels, make a couple of gallons of lemonade, fill a galvanized tub with beer, etc., etc., etc. Oh yes, and…purchase airplane tickets for your “crew” and you to come to my home so we make and enjoy this delicacy together. That would be best case scenario, but if you can’t make it, the following is my backup plan: invite our children and grandchildren, set up my grill, hand Jeff a beer, pour a glass of wine for me, marinate the chicken and follow your beautifully written instructions. THIS…is going to happen! I so love this post and all your photos. Susie! You’re so kind and your comments here make my day! 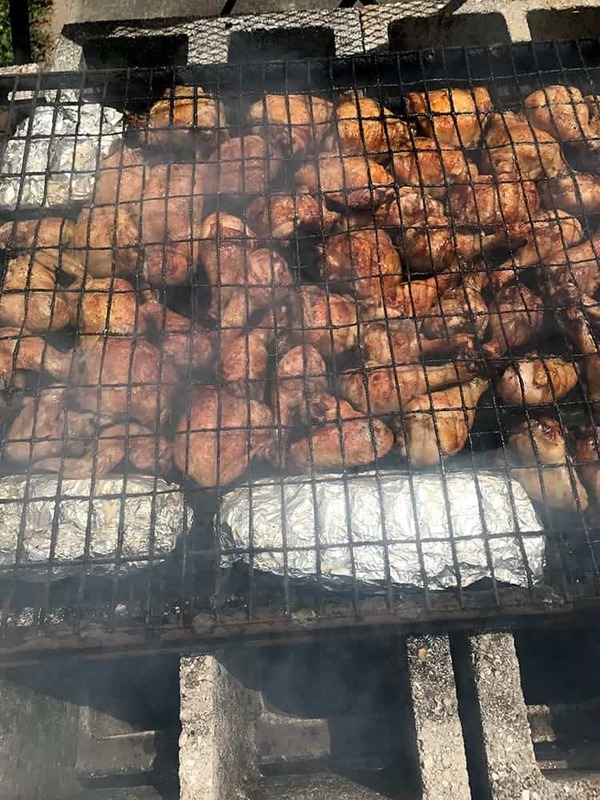 This Cornell Chicken Barbecue is part of who we are as a family, more than just about any other recipe with the exception of one or two others. 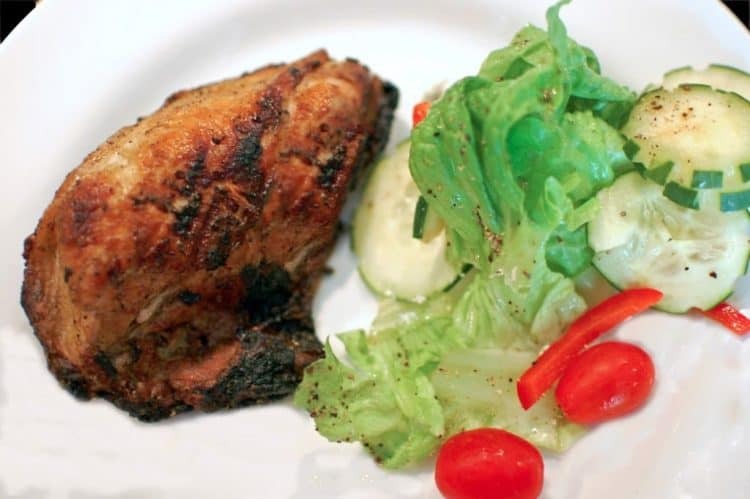 I hope that everyone has a recipe like this in their life because as people come and go, loved ones pass on and new generations are born, this grilled chicken recipe is a perfect example of something that transcends time and in doing so becomes intertwined in the heritage and legacy of a family. It is just one more example of the magical power of food to connect people and keep them together. I love the idea of you making this in your backyard. The lemonade and beer sound perfect and I might also suggest some baked beans, a green salad, and maybe indulge in some salty old-fashioned potato chips. I would love to be there and even more I would love to show you in person how we make this magical chicken recipe! Thanks again for stopping by; seeing your comment has been my big smile of the day! Any oven-friendly tips for the few of us who don’t have grills? Hi Julie and thanks for the great question. My mom use to occasionally finish this Cornell Chicken Barbecue in the oven and it’s still as delicious as ever. As a couple of hints: I would consider either searing it in a hot skillet just to brown the outside before putting it in the oven, or, maybe put it on the highest rack of your oven and place under the broiler for a couple of minutes for the same effect. Either way, after the outside is browned, cover it in foil and bake at 350° F until it’s done. It won’t be quite the same as from the grill but I think you will enjoy. Thanks for reading Platter Talk, we hope to see more of you around here! Love to see the picture of your family cooking in the BBQ and the one with your kids. Thanks for posting the recipe. Anyone living in Lowville know the flavor of this BBQ. It is a great money maker sold on weekends. One minor correction to your post. Cornell is in Ithaca NY. You have been out of Ny too long! Thanks for the kind comments and the refresher on my New York geography! I haven’t made this forever. Glad I found your site. Your photos are gorgeous. Thank you so much for the great recipe.It sounds fabulous. Found your blog when I was looking for the Cornell BBQ chicken recipe. Grew up in Lewis Co – Croghan – and my mom made this frequently. 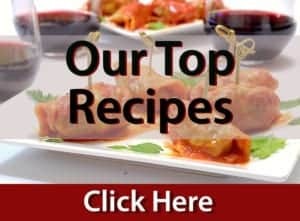 Looking forward to receiving new recipes from your blog! Welcome to Platter Talk, and definitely a taste of my native Lewis County. Thanks so much for the comments and we hope to see much more of you on the site! I am visiting after seeing your video. I do not want you to ever loose the writing style you began with – it draws you in. Be you always. OMG, this looks amazing! Time to clean off my grill. Summer here I come! Thanks, Caroline. I hope you give this a try; it’s a sure bet that you will make again and again. Dan this chicken looks fantastic! Thanks, Nancy. We made it again this Memorial Day! I hope you try it some time. I absolutely LOVE bbq chicken and yours looks wonderful! What a fun barbecue! Thanks, Brandy! Hope you had a nice holiday filled with good tasting food! Such a fav thanks for giving the recipe instead of just a list of ingredients without instructions on how to do the grilling. Now I know why the guys stand around all morning at the vfw tending the chicken. It’s not just for lazy fraternization. Danielle – Thanks for the comment and stopping by the site. Actually lazy fraternization is always optional when making this, just a little FYI ;-). It is an ultimately delicious way to toil away a few hours and if you’ve got others to share in the fun, hey – why not? Our family had three staples for Sunday dinner. Spaghetti and meatballs, if my mom was feeling ambitiuos. KFC from Ver’s if my parent’s were hung over from too much partying at the Elk’s Club the night before. Or BBQ chicken just as described here, when my dad felt like manning the coals on a warm Sunday afternoon. NOTHING says Lewis County like BBQ chicken and baked beans. It was YEARS before I knew that, to most people, BBQ chicken meant chicken made with tomato-based BBQ sauce. That has it’s place for sure, but to me BBQ chicken does not conjure up thoughts of sweet sauce in a bottle! I’m with you on what BBQ “really” means! Thanks for the comments! Thanks for the kind comments. I look forward to following your blog! Oh, now there is just nothing better than marinaded chicken grilled over hot coals. I can practically taste it through your delicious pictures, Dan! Great recipe, thanks for sharing. Thanks so much for stopping by. I hope you give this recipe a try! My family too grew up with bbq chicken, there is nothing better. Great post. 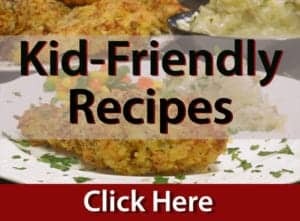 I always thought my family made this recipe up! Too funny. Great post and thanks for a great writeup! Yumm….I’m from New York state and I have to tell you, this is the BEST! This sounds awesome. Since I do not have a charcoal grill I will have to do it on a gas grill. Thanks for posting and can’t wait to try. Gas works fine – just remember, slow and low. Thanks for commenting, and enjoy! !